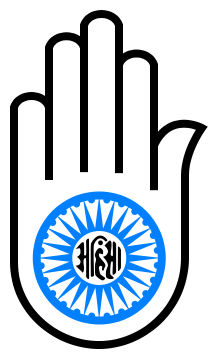 The symbol of the Jain religion, which represents "Ahimsa" (non-violence) in thought, word, and deed. Syādvāda (Devanagari: स्यादवाद meaning "Could-be-ism") is the Jain doctrine of epistemological relativism underpinning all Jain logic, which is central to their philosophical perspective that all propositions about truth are based on finite, limited, and contextual postulates. In other words, Syādvāda is the theory of conditioned predication which provides an expression to anekānta by recommending that epithet Syād be attached to every expression. Syādvāda is not only an extension of Anekānta ontology, but a separate system of logic capable of standing on its own force. Jainism claims that since reality is complex, no single proposition can express the nature of reality fully. Thus the term "syāt" should be prefixed before each proposition giving it a conditional point of view and thus removing any dogmatism in the statement. The etymology of syadvada comes from two roots. Syat means "may be," whereas vada means "assertion." Placed together syādvāda becomes the assertion of what may be, the assertion of possibilities. The Sanskrit etymological root of the term Syād is "perhaps" or "maybe," but in context of syādvāda, it means "in some ways" or "from a perspective." These Jain philosophical concepts made very significant contributions to the ancient Indian philosophy, especially in the areas of skepticism and relativity. Syād-asti—"in some ways it is"
Syād-nāsti—"in some ways it is not"
Syād-asti-nāsti—"in some ways it is and it is not"
Syād-asti-avaktavyaḥ—"in some ways it is and it is indescribable"
Syād-nāsti-avaktavyaḥ—"in some ways it is not and it is indescribable"
Syād-asti-nāsti-avaktavyaḥ—"in some ways it is, it is not and it is indescribable"
Syād-avaktavyaḥ—"in some ways it is indescribable"
Each of these seven propositions examines the complex and multifaceted reality from a relative point of view of time, space, substance, and mode. To ignore the complexity of the objects is to commit the fallacy of dogmatism. The Jain doctrine of Syadvada then is intended to demonstrate that among several truths about a particular thing, one or the other or both may in fact be valid resulting in a qualified prediction as shown in the theory of Manifold Predictions. A group of blind men heard that a strange animal, called an elephant, had been brought to the town, but none of them were aware its shape and form. Out of curiosity, they said: "We must inspect and know it by touch of which we are capable." So, they sought it out, and when they found it they groped about it. In the case of the first one person, whose hand landed on the trunk, said "This being is like a drain pipe." For another one whose hand reached its ear, it seemed like a kind of fan. As for another person, whose hand was upon its leg, said, "I perceive the shape of the elephant to be like a pillar." And in the case of the one who placed his hand upon its back said "Indeed, this elephant is like a throne" Now, each of these presented a true aspect when he related what he had gained from experiencing the elephant. None of them had strayed from the true description of the elephant. Yet they fell short of fathoming the true appearance of the elephant. The concepts of anekānta and syādvāda allows the Jains to accept the truth in other philosophies from their perspective and thus inculcating a tolerance for other viewpoints. Anekantvāda is non-absolutist and stands firmly against all dogmatisms, even including any assertion that only Jainism is the right religious path. It is thus an intellectual Ahimsā or Ahimsā of mind. "Comprehend one philosophical view through the comprehensive study of another one" (5.113). In Anekantvāda, there is no "battle of ideas," because this is considered to be a form of intellectual himsa or damage, leading quite logically to physical violence and war. In today's world, the limitations of the adversarial, "either with us or against us" form of argument are increasingly apparent leading to political, religious, and social conflicts. "Those who praise their own doctrines and ideology and disparage the doctrine of others distort the truth and will be confined to the cycle of birth and death" (1.1.50). This ecumenic and irenic attitude, engendered by Anekānta, allowed modern Jain monks like Vijayadharma suri to declare: "He is neither Jain nor Buddhist, Vaisnava nor Saiva, Hindu nor Muslim, but a traveler on the path of peace shown by the supreme soul, the God who is free from passion." Even the mounting ecological crisis is linked to adversarialism, because it arises from a false division between humanity and "the rest" of nature. The modern judicial systems, democracy, freedom of speech, secularism, all implicitly reflect an attitude of Anekānta. Many authors like Kamala Jain, have advanced that the Jaina tradition with its emphasis on Ahimsā and Anekānta is capable of providing a solution to a host of problems facing the world: Religious intolerance, terrorism, wars, depletion of natural resources, environmental degradation and like. Since childhood, Mahatma Gandhi was exposed to the actual practice of non-violence, non-possession and anekāntavāda. He grew up in an area with a continued Jain population and one of his good friend was a Jain. According to his biographers like Uma Majumdar, Rajmohan Gandhi and Stephen Hay, these early childhood impressions and felt experiences contributed to Gandhi’s character formation and further moral and spiritual development. Mahatma Gandhi, in his writings, attributed his seemingly contradictory positions over a period of time to his learning process, experiments with truth and his belief in anekāntavāda. He proclaimed that the duty of every individual is to determine what is personally true and act on that relative perception of truth. According to Gandhi, while duty bound to act according to his relative truth, a satyagrahi is equally bound to learn from truth held by his opponent. In response to a friends query on religious tolerance, he responded in Journal "Young India—21 Jan 1926:"
I am an Advaitist and yet I can support Dvaitism (dualism). The world is changing every moment, and is therefore unreal, it has no permanent existence. But though it is constantly changing, it has a something about it which persists and it is therefore to that extent real. I have therefore no objection to calling it real and unreal, and thus being called an Anekāntavadi or a Syādvadi. But my Syādvāda is not the Syādvāda of the learned, it is peculiarly my own. I cannot engage in a debate with them. It has been my experience that I am always true from my point of view, and am often wrong from the point of view of my honest critics. I know that we are both right from our respective points of view. And this knowledge saves me from attributing motives to my opponents or critics. The seven blind men who gave seven different descriptions of the elephant were all right from their respective points of view, and wrong from the point of view of one another, and right and wrong from the point of view of the man who knew the elephant. I very much like this doctrine of the manyness (sic) of reality. It is this doctrine that has taught me to judge a Musulman (sic) from his standpoint and a Christian from his. Formerly I used to resent the ignorance of my opponents. Today I can love them because I am gifted with the eye to see myself as others see me and vice versa. I want to take the whole world in the embrace of my love. My Anekāntavāda is the result of the twin doctrine of Satyagraha and Ahimsa. The interrelated doctrines of Anekānta and Syādavāda are often criticized on grounds that they engender a degree of hesitancy and uncertainty and may compound problems rather than solve them. It is also pointed out that Jain epistemology gains assertibility for its own doctrine, but at the cost of being unable to deny contradictory doctrines. Furthermore, it is also argued that this doctrine becomes self-defeating when it is argued that if reality is complex and nothing can describe it completely, then this doctrine itself is incomplete and hence an ekantvadi. This criticism seems to have been anticipated by Ācārya Samantabhadra when he says: "From the point of view of pramana (means of knowledege) it is anekānta (multi-sided), but from a point of view of naya (partial view) it is ekanta (one-sided)." In its defense, Jains also point out that anekānta manages to reconcile the opposing view points rather than simply refute them and helps in avoidance of one-sided errors and confusion that the ekantvadins tend to make. It is impossible that contradictory attributes such as being and non-being should at the same time belong to one and the same thing; just as observation teaches us that a thing cannot be hot and cold at the same moment. The third alternative expressed in the words—they either are such or not such—results in cognition of indefinite nature, which is no more a source of true knowledge than doubt is. Thus the means of knowledge, the object of knowledge, the knowing subject, and the act of knowledge become all alike indefinite. How can his followers act on a doctrine, the matter of which is altogether indeterminate? The result of your efforts is perfect knowledge and is not perfect knowledge. Observation shows that, only when a course of action is known to have a definite result, people set about it without hesitation. Hence a man who proclaims a doctrine of altogether indefinite contents does not deserve to be listened anymore than a drunken or a mad man. 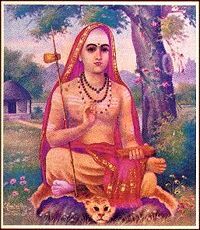 However, Sankara failed to take the real position of Anekānta into account by identifying syādavāda as sansayavāda, that is, "agnosticism" which was once articulated by Sanjaya Belatthiputta. He failed to take into consideration that the affirmation of the existence of an object is in respect to the object itself and its negation is in respect to what the object is not, giving an object positive and negative attributes at the same time without any contradictions. "With the differentiation removed, all things have dual nature. Then, if somebody is implored to eat curd, then why does not eat camel?" "The person, who criticises without understanding the prima facie view, is acting like a jester and not a critic. The Buddha was born a deer and deer was born as Buddha; but Buddha is adorable and deer is only a food. Similarly, due to strength of an entity, with its difference and similarities specified, nobody would eat camel if implored to eat curd." ↑ John M. Koller, Syādvāda as the epistemological key to the Jaina middle way metaphysics of Anekāntavāda, Philosophy East and West 50 (3): 400-8. ↑ 3.0 3.1 P.C. Mahalanobis, The Indian-Jaina Dialectic of Syadvad in Relation to Probability (I). Retrieved August 9, 2008. ↑ 4.0 4.1 McEvilley (2002), 335. ↑ 5.0 5.1 Duli Chandra Jain (ed.) (1997), 21. ↑ Hughes, Marilynn (2005), 590. ↑ 8.0 8.1 Grimes (1996), 312. ↑ Jain World, ELEPHANT AND THE BLIND MEN. Retrieved August 9, 2008. ↑ Ronald Huntington, Jainism and Ethics. Retrieved August 9, 2008. ↑ Mark Owen Webb, The Jain Philosophy, The Internet Encyclopedia of Philosophy. Retrieved August 9, 2008. ↑ 26.0 26.1 26.2 Pandya (2001), 5209-10. Chatterjea, Tara. 2003. Knowledge and Freedom in Indian Philosophy. Lanham, MD: Lexington Books. ISBN 978-0739104569. Duli Chandra Jain (ed.). 1997. Studies in Jainism: Reader 2. New York: Jain Study Circle Inc. ISBN 0-9626105-2-6. Dundas, Paul and John Hinnels (ed.). 2002. The Jains. London: Routledge. ISBN 0-415-26606-8. Gandhi, Mahatma. 1955. In Prabhu: Truth is God: Gleanings from the Writings of Mahatma Gandhi Bearing on God, God-Realization and the Godly Way. Ahmedabad: Navajivan Publishing House. Griffin, David Ray. 2005. Deep Religious Pluralism. Louisville, KY: Westminster John Knox Press. ISBN 066422914X. Grimes, John. 1996. A Concise Dictionary of Indian Philosophy: Sanskrit Terms Defined in English. New York: SUNY Press. ISBN 0791430677. Hay, Stephen N. 1970. "Jain Influences on Gandhi's Early Thought," in Sibnarayan Ray (ed. ), Gandhi India and the World. Bombay: Nachiketa Publishers. Hughes, Marilynn. 2005. The Voice of Prophets, Volume 2 of 12. Morrisville, North Carolina: Lulu.com. ISBN 1411651219. Jaini, Padmanabh. 1998. The Jaina Path of Purification. New Delhi: Motilal Banarsidass. ISBN 81-208-1578-5. Koller, John M. Syadvada as the Epistemological Key to the Jaina Middle Way Metaphysics of Anekantavada. Philosophy East and West 50 (3): 400-7. Majmudar, Uma. 2005. Gandhi's Pilgrimage of Faith: From Darkness to Light. New York: SUNY Press. ISBN 0791464059. Matilal, B.K. 1981. The Central Philosophy of Jainism (Anekantavada), L.D. Series 79. Ahmedabad. McEvilley, Thomas. 2002. The Shape of Ancient Thought: Comparative Studies in Greek and Indian Philosophies. New York: Allworth Communications, Inc. ISBN 1581152035. Nakamura, Hajim. 1992. Comparative History of Ideas. Delhi: Motilal Banarsidass Pub. ISBN 812081004X. Pandya, V. 2001. "Refutation of Jaina Darsana by Sankaracarya." In Nagendra Kr. Singh, Encyclopedia of Jainism. New Delhi: Anmol Publications. ISBN 8126106913. Rankin, Adian. 2006. The Jain Path: Ancient Wisdom for the West. Winchester, UK: O Books. ISBN 1905047215. Sethia, Tara. 2004. Ahimsā, Anekānta, and Jaininsm. Delhi: Motilal Banarsidass Publ. ISBN 81-208-2036-3. Shah, Natubhai. 1998. Jainism: The World of Conquerors, Volume I and II. Sussex: Sussex Academy Press. ISBN 1898723303. Sharma, Arvind. 2001. Jaina Perspective on the Philosophy of Religion. Delhi: Motilal Banarsidass. ISBN 8120817605. Sonnleitner, Michael W. 1985. Gandhian Nonviolence: Levels of Satyagraha. India: Abhinav publications. ISBN 8170172055. Jacobi, Hermann (1884). Ācāranga Sūtra, Jain Sutras Part I, Sacred Books of the East, Vol. 22. Jacobi, Hermann (1895). in (ed.) Max Müller: Jaina Sutras, Part II : Sūtrakrtanga, Sacred Books of the East, Vol. 45. Oxford: The Clarendon Press. Pravin K. Shah on Anekantvada. The Indian-Jaina Dialectic of Syadvada in Relation to Probability By P.C. Mahalanobis. This page was last modified on 9 November 2015, at 15:23.